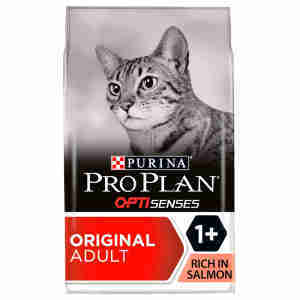 PURINA PRO PLAN Adult OPTISENSES Rich in Salmon is for the healthy maintenance of adult cats. The food combines all essential nutrients including vitamins A, C and E, omega 3 & 6 fatty acids, animo acids and proteins to provide a tasty and nutritional meal. OPTISENSES is the only Purina Optirange food that provides specific nourishment to your cat's brain. Healthy joints and good mobility due to a high level of protein which nourishes your cat’s muscles and helps him stay a healthy weight and in lean condition. Supports a healthy immune system through high levels of antioxidant vitamins, including vitamins C and E.
Helps protect teeth from plaque and tartar build-up due to a crunchy kibble texture and special minerals which are proven to significantly reduce tartar build-up. Salmon (18%), Dehydrated Poultry Protein, Wheat, Rice, Maize Gluten Meal, Wheat Gluten Meal, Animal Fat, Dried Egg, Maize, Minerals, Dried Chicory Root, Cellulose, Digest, Yeasts, Fish Oil. Nutritional Additives: IU/kg:Vit A:37 000, Vit D3:1200, Vit E:670 mg/kg:Vit C:160, Ferrous sulphate monohydrate:(Fe: 81), Calcium iodate anhydrous:(I: 2.0), Cupric sulphate pentahydrate:(Cu: 12), Manganous sulphate monohydrate:(Mn: 38), Zinc sulphate monohydrate:(Zn: 130), Sodium selenite(Se: 0.12), Antioxidants. ProPlanOptisenses is now my cats new favourite dry food, she thoroughly adores it, which is a big deal as she is a very fussy eater. With this, she loves it! No snobby character traits, no quarms, she eats all her food and begs for more afterwards. Within the first couple of weeks, I didn't really notice too much of a benefit apart her poo becoming a lot less smellier! Having now finished the 3kg bag, I can honestly say that I notice the health benefits. Meeko seems more chilled out and content as she hasn't been scratching the sofa whilst my partner and I are asleep. The other two big benefits are that her fur is noticeably softer and shinier all the time now, not just smoother when she decides to clean herself. Also, when Meeko goes for a poo in her litter tray, it doesn't smell anymore, compared to some really foul smelling ones on previous wet and dry foods. Rest assured, I won't be buying anything else from now on. Happy cat = Happy owner. Wow what a product! Very very happy with this and would recommend this to anyone. All the important information is all on the packaging and also the portion sizes are just right!